It's been a busy few years for Lexus. The brand has comprehensively updated its model range with a new GS, LS and now this - the all-new IS. It shows off the new Lexus style at its best with a more svelte look than its predecessor along with a completely new interior. Indeed there's much riding on the IS, Lexus says it has the potential to change the image of Lexus for good. Of course there's not too much wrong with that image. Lexus has a well deserved reputation for quality. The brand regularly tops owners' and reliability polls such as the JD Power survey and its dealers are generally seen as the best in the business. However, it has often lacked the style and handling prowess of rival saloons. And it's down to the IS to change that. 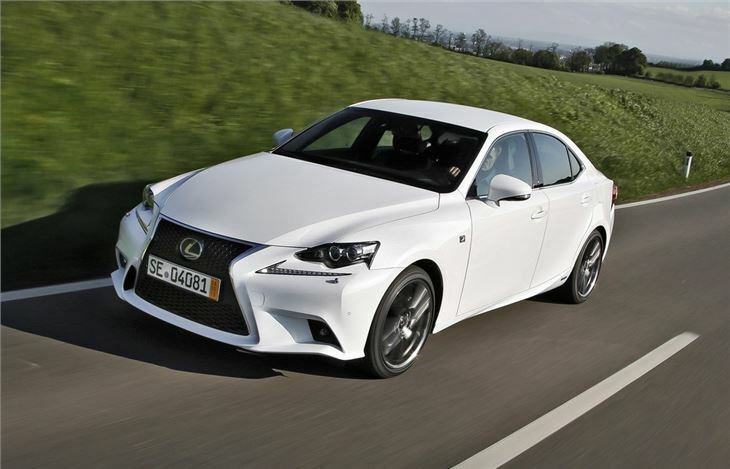 Compared to drab Lexus designs of the past, the IS has a lot more going on. There are creases and angles galore with Lexus attempting to give it a coupe-like profile. The rear end is a bit busy and it's a car that's quite colour sensitive, but it certainly has enough about it to stand out from the competition with a classy look. Refinement and quality have always been key to the appeal of the IS and that continues with this third generation model. The interior is a huge leap forward from the outgoing model with a far more modern and design-led appearance. There's now no trace of Toyota switches or controls, this is all bespoke Lexus and all the better for it. Touches like the neatly designed steering wheel and the great looking analogue clock between the air vents give it a sophisticated feel but the real highlight is the central console and air conditioning controls which look like a high-end stereo system. There are even touch sensitive 'sliders' for the temperature control which add to the modern edge. It's no surprise to see that top models come with a Mark Levinson stereo system - it's clearly been an inspiration for much of the interior. Comfort is mightily impressive with supportive seats that use a new foam design that means there are no gaps between the padding and the leather. There's 50 per cent more legroom in the back than before although the high central transmission tunnel means the middle seat is pretty much unusable. However, the rear seats do now at least fold down making the IS far more practical. So it all seems very promising so far. But there could be one big fly in the ointment for many buyers - the lack of a diesel engine. Lexus is sticking with a petrol engine for the IS 250 but it's dropping the diesel engine of the previous IS and instead focussing on hybrid power. Is this is a mistake? Well Lexus points out that there are already plenty of diesel premium saloons like the ubiquitous BMW 320d so it needs to offer something different. That something different is the IS 300h which uses a 2.5-litre four-cylinder engine alongside an electric motor which together produce 223PS. Hybrids are nothing new of course but the IS is one of the most advanced. The change from electric to engine power is much less noticeable than on something like a Prius, yet thanks to plenty of torque available from a standstill, the IS 300h has plenty of go. On paper it will accelerate from 0-62mph in 8.3 seconds but the IS 300h is really about efficiency. It will return a claimed 65.7mpg if you choose the entry SE model. That's easily better than diesel engined competitors with similar - or even less - power. But the best part is that this equates to just 99g/km of CO2 - an astonishingly low figure for a car this size. If that doesn't get the IS noticed by company car drivers then nothing will. It also means zero annual VED and exemption from the central London congestion charge. The gripe with the IS 300h is the CVT gearbox. While it's good for economy, the lack of any real gearchanges means that if you accelerate hard you're met with the constant whine of high revs. It's not overly noisy in the Lexus, but it diminishes the overall refinement and isn't a pleasant experience. It means overtaking is not as simple as it would be with a turbocharged diesel. However, if you're gentle with the IS 300h it's a very refined motor. At motorway speeds it's incredibly serene, helped by minimal wind and road noise. And the ride reflects this, as it smooths out uneven surfaces really well. But if it's rewarding performance you're after, it's best to look elsewhere. That said, Lexus has worked hard on the handling set-up of the new IS. In the marketing spiel it spoke of making the IS 'the most enjoyable car to drive in its class.' That's a big ask given the competition but the IS does make a good fist of it. It has a more rigid bodyshell, underbody bracing along with a new multi-link rear suspension set-up. The result is a big improvement on the old model. The new IS is much more stable in corners and handles tidily with little bodyroll. It's not particularly enjoyable though, the steering feels too artificial and it's not especially sharp through bends, but it is very composed and reassuring. What doesn't help is the brakes. They lack progression and are a bit 'on or off' when it comes to slowing down. You can opt for an F Sport model - available on both the IS 250 and IS 300h - which gets a sportier exterior look (shown on the car in our pictures) and tuned suspension which proves better in corners. The F Sport also comes with a bespoke instrument layout featuring the moving centre ring that first appeared in the LFA. Overall the IS is a exactly what you expect from Lexus - a high quality and well engineered car. It's an improvement on the old IS, especially in terms of handling and refinement, and now has the modern looks, both inside and out, that it was previously lacking. The IS 300h is of course the one to go for and prices start at £29,495 although be aware that higher trim level models emit more than 99g/km of CO2, although only marginally.